Canada Post has just released a pair of stamps celebrating the 100th anniversary of everyone’s favourite literary redhead. No we’re not talking about Pippi Longstocking. 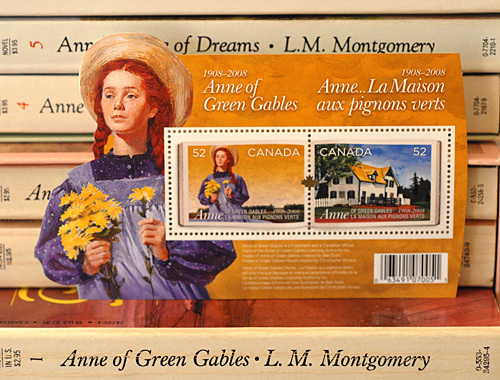 It is of course Lucy Maud Montgomery’s creation, Anne of Green Gables.The stamps, based on paintings by Ben Stahl (Anne) and Christopher Kovacs (Green Gables house), are available individually or in a variety of sets. The souvenir sheet with both stamps (shown here, resting against a set of L.M. Montgomery Anne books) is only $1.04 Canadian.